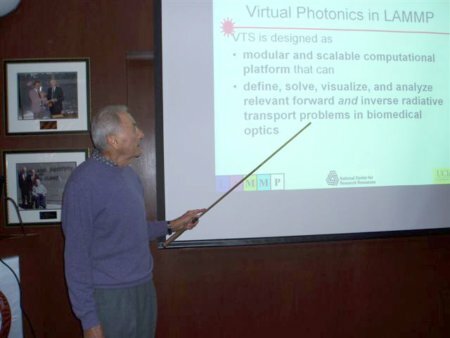 Dr. Jerry Spanier, Claremont University Emeritus Professor of Mathematics, and Beckman Laser Institute Research Faculty, has developed a short course on Monte Carlo methods, 'Monte Carlo Methods and Virtual Photonics'. The course has been given in six 1.5 hour classes. All course materials, including lectures and slides are available on the LAMMP website: Course Website The primary audience consists of students, postdocs, researchers, faculty and visiting scientists at the Beckman Laser Institute, Department of Biomedical Engineering, and the Center for Complex Biological Systems (CCSB). The course is open to all who are interested in learning about this versatile and robust model for describing many physical systems. Topics treated are the equations of radiative transport, the simulation process, the connections between the physical and the computational models, the simulation process, and diffusion and higher order transport approximations. Emphasis is placed on ideas most important for intelligent use of Monte Carlo codes, and both conventional and more advanced Monte Carlo techniques will be treated. This informal series is meant to help integrate and expand the use of efficient computational methods across the LAMMP core technologies and to spur the development of written and audio-visual content for the future LAMMP Workshops on the Virtual Tissue System (VTS) and its software byproducts the Application Toolkits (ATKs). An attempt is being made, thanks to the joint sponsorship of these lectures by LAMMP and CCBS, to capture and digitize the lectures for the future development of more polished educational materials.